Mrs Prue Gillies AM is an animal welfare advocate, previously serving as a Board member of RSPCA Victoria and the World Society for the Protection of Animals (WSPA). With extensive experience as an educator, including Principal of Ruyton Girls’ School, Prue was most recently sole proprietor of Kids on Collins. 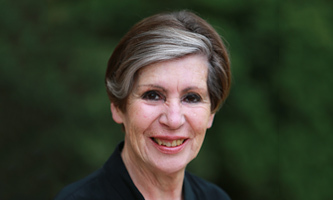 Prue has served as a Board member of a wide range of organisations including The Queen’s Trust, The Invergowrie Foundation, Janet Clarke Hall, Fintona Girls’ School and Toorak College. Appointed a Member of the Order of Australia for her services to education and the community, Prue subsequently became Chairman of the Order of Australia Association, Victoria. A Board member of The Lost Dogs’ Home since 2012, Prue was Chair in 2015-2017 and continues her philanthropic commitment to those organisations which provide protection, care and support to animals in both national and international settings.